The following is a specification proposal for a new pseudo-random character generator (PRCG), tentatively called the “Tiny Tots PRCG”. This specification is to be considered open and royalty free; everyone is free to implement and extend this specification, although attribution is appreciated. It usefulness, however, may be limited and may only be of interest to cryptographic and mathematical academics or really bored parents. An organic, biological processing core based on an early revision of the Homo sapien architecture, commonly referred to as a “toddler”. The processor must be upgraded from the base “infant” model, but must not have been upgraded to the “grade schooler” patch. A significant amount of liquid. Water (dihydrogen oxide or hydrogen hydroxide) is highly recommended, although any fluid that will not cause damage to the processor core or the other physical components of the system may be a possible substitute. Excess liquid is not recommended as it increases the risk of permanent damage to the processor. Be aware that the original and final volumes of liquid may vary during the process due to evaporation, splashing, ingestion, and liquid waste excretion. A collection of foam characters and/or digits comprising the alphabet from which random characters will be selected. A entropy pool capable of containing the processor, the liquid, and the character set. Material composition is not significant so long that characters from the character set immersed in the liquid will be able to adhere to the side of the pool if placed there. Introduce character set to entropy pool. Stir vigorously. Introduce processor to entropy pool. 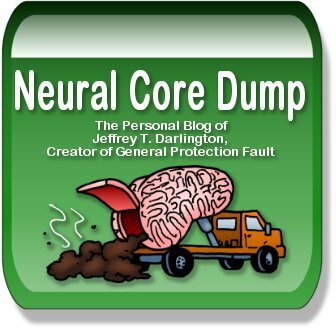 Note that some processors function well in the entropy pool environment while others produce various errors. Performance may vary based on processor model. Optional: introduce processor-safe detergent and remove dirt and debris for the outer casing. Periodic cleaning will improve overall processor performance over time. Initiate the pseudo-random character generation process by removing one character from the entropy pool and placing it on the casing of the pool. This casing will act both as a display device and as a character array to hold the final generated value. The initial character in the array will serve as the seed value. Encourage the processor to repeat the process. Additional seed characters may be required to initiate independent processing, although be aware that a larger seed will result in less overall entropy in the final result. Allow processor to operate on the task. The removal of characters from the result array and reintroduction to the entropy pool is expected, encouraged, and pretty much unavoidable. This should improve the entropy of the final value. Continue process until the processor swaps threads for another program, begins to malfunction, or it is time for the processor’s sleep cycle. Be aware that if process swapping occurs, the processor may swap back to the PRCG task unaided. Once execution is deemed complete, extract the processor from the entropy pool and remove excess liquid. If characters remain in the pool, leave them; do not introduce them to the result array or you may taint the entropy. Secure the processor to ensure proper ongoing function. Never leave the processor unattended without placing it in hibernation mode. Once the processor is secure and you have an opportunity to return to the entropy pool, read and record the result from the character array. Be aware that characters will likely be oriented in unconventional and non-standard notation. Pick one corner of the display device and read the values in an organized fashion. For example, pick the upper left corner and read the characters left to right, returning to the left at the end of a row and repeating with the next row. Continue until all characters are read from the array. Ignore any characters that remain in the pool. Store the result for later use. The processor has a limited lifespan during which the pseudo-random functionality is optimal. It must have been upgraded sufficiently to execute crude motor skills, but not so far as to initiate higher pattern recognition skills such as character recognition, color matching, etc. that may taint the randomness of the result (i.e. an upgraded processor may inherently group characters of the same color). Most foam character sets have limited unique character values, such as the standard English alphabet or Arabic digits (0-9). Many times these characters sets only contain a single entry per character, eliminating the possibility of repeat characters in the final sequence and reducing the overall entropy of the result. Introducing additional character sets may increase entropy but may overwhelm the processor. Some foam character sets come with additional non-standard glyphs, often in the shape of iconic characters from animated television series. Before initiating the pseudo-random generation process, map standard characters, digits, symbols for the non-standard glyphs (Spongebob = asterisk, Patrick = pound hash, etc.). Sequence generation by this process is inherently slow and is likely not practical for everyday use. However, it does make for an entertaining thought exercise and will likely prove entertaining to owner/operators of the processor. You know you’ve officially earned your fatherhood stripes if you can say the above sentence with a straight face and a casual, nonchalant inflection. One of the first real trials by fire any parent has to face is the dreaded poopy diaper. I’ve been told that babies have no concept of things smelling “good” or “bad”; they only differentiate things as smelling differently. This is probably good since they could spend an unspecified amount of time sitting in their own filth until their guardian finally finds out what happened and takes care of it. Nevertheless, we as a species eventually developed a total aversion to the odor of our own feces, most likely as a mechanism to make sure we don’t accidentally consume any in our quest for sustenance. As a general rule, things that smell bad aren’t very good to eat, certain types of fragrant cheeses not withstanding. Many of us in today’s modern, high-tech, hyper-sanitary world tend to forget this fact, as we rarely need to use this knowledge for survival. We forget it, that is, until it comes flying right back into our faces–in some cases, literally–when we start reproducing. 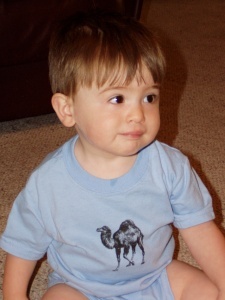 Anecdote #1: My wife called me in yesterday morning to help change the boy’s diaper. He had just awakened from a nice, restful, 12.5 hour night’s sleep (lucky him!) bearing a full load (OK, not so lucky). Having obtained such a high quality and quantity of sleep, he was in no mood to lie there peacefully. He was in full go-mode with the wiggle quotient cranked to high, babbling happily with every other word being “Da da”. In such situations, one of us takes the low road and performs the actual toxic clean up while the other takes the high road and does their best to restrain the flailing legs as he kicks and squirms. Well, my wife extracted him from the crib and was on clean-up duty when she ascertained that she required my assistance with restraint. So I walked into the room and instinctively reached out and grabbed the pair of waving ankles before she even had the chance to start uttering her warning. “He just stuck his ankle in it,” she said sheepishly, still wiping frantically at his bottom. I extended my index finger into view. Yep, there it was, right there on the tip of my finger. I’m not sure if it was the fact that I hadn’t had my morning shot of caffeine yet or just the jaded numbness of parental experience, but all I could manage was, “It’s all right, it’s just poopy.” My wife nearly snorted with laughter. I very calmly remained at my station until the clean-up was completed, the diaper was closed, and the boy secure. I then proceeded calmly yet briskly across the hall to the bathroom and scrubbed until my finger was raw. I have a bad habit of biting my fingernails. I think I kicked that habit, at least for the day. Anecdote #2: Hours later, we’re about to head out for some longer over-due shopping. It’s usually my job to carry the boy downstairs to the car and buckle him in while my wife gathers all his various accessories (diaper bag, toys, etc.). Right now the two burdens are about equal in weight, but he’s steadily increasing in mass, giving me the weightier load. I hoisted him up to my hip in the typical carrying configuration, and a faint yet unfortunately familiar scent wafted to my nostrils. “Powder fresh.” I didn’t like the implications of this deduction. Just have to share a proud parent moment this morning. Those easily nauseated by baby cuteness or sappy parental sentimentality should avoid this post. Ben’s been sleeping well through the night now, but the little guy has had the occasional tendency to get us up ridiculously early in the morning. This morning, it was around 3:30 AM and for no apparent reason. Yesterday, it was more like 4:30, but the reason was definitely legit; the poor little guy had an “accident” in the middle of the night, so his pajamas, blanket, and bed sheets all needed to be changed. Since he woke up in quite the fuss, we whipped up a bottle and fed him until he fell back asleep. Once he was down, we got to go back to bed ourselves. I’ve never been one to go back to sleep easily after I’ve been awakened, but that’s changed in the past ten months. I’ve also stepped up in teaching him the days of the week so he’ll hopefully realize that on weekends we sleep in and weekdays are when we get up ridiculously early (and usually not because we want to). I woke up again around 7 AM, unable to get back to sleep. So I got up and started poking around with our newest toy (our anniversary present to each other, which I’ll probably post about shortly in a separate post). It wasn’t long before Ben woke up again and I could hear him moving around through the baby monitor, so I went in to check on him. As I walked through the door, he was laying on his back, which told me he was wide awake, as he’s been taking to sleeping on his side and belly lately. As I walked up to the crib, he opened his eyes and looked dead at me. Then, plain as day, he said rather definitively, “Da da.” It wasn’t a stream of endless “da da da da” babble or a mixture of bizarre baby sounds strung together in a haphazard fashion. He looked at me, he recognized me, he knew what my “name” was, and he verbalized his acknowledgment. That’s a big step there in infant development. It’s also something that should turn any father’s heart into a big squishy mush. I immediately picked him up and snuggled him up to my shoulder, in part because I knew he’d be hungry and would need another diaper change, but also because I didn’t want him to see me getting all misty-eyed. Needless to say, I was on Cloud 9 the rest of the day. Technically, I don’t think this was his first word. He’s babbled quite a bit the last month or two, and he was doing “ma ma ma” a bit before he was doing “da da da.” At the same time, I can’t think of anytime he’s verbally acknowledged something by name. I’m afraid, though, that we’ll have to officially say his first word was probably “pooh”… which I’m hoping he meant “Winnie the” and not any other connotations thereof. Not surprising given his parentage, Ben has taken an early interest in computers. If he’s awake in the mornings while I’m doing my morning Web surfing, I’ll often put Apollo the laptop next to me while holding him, so I can keep reading comics while he watches Baby Einstein. This often becomes a distraction for him, though, as he’d much rather see what Daddy is up to that’s undoubtedly more interesting than puppets. This usually turns into a wrestling match as he wants to play with Daddy’s toy, which is infinitely more cool than any of his. Well, this morning I decided to give him a crack at the thing. After waiting for Apollo to boot (“Remember, Ben, this is a Windows box, so that takes a while….”), I opened a word processor, changed the font to something large and bright so it was easy to see that he was actually making it do things, and let him go to town. I had to intervene a couple times when he hit Control or Alt, and I deleted a good bit of the unnecessary whitespace (he was particularly fond of the large Enter key and had nine pages of carriage returns), but otherwise left it as it was and thought I’d go ahead and share. Not a lot of substance, but he’s still getting the hang of this “language” thing. Still, it’s probably better than 90% of the blog posts out there anyway…. Someone has started teething. Anything and everything he gets his hands on goes straight into his mouth. Guess what one of his favorite “teething rings” is? Daddy’s gonna set up SpamAssassin. Daddy’ll catch those jerks with a honeypot. He’ll report their crimes to their ISPs. Daddy’ll DDoS them back to 1984. You and daddy can deathmatch to celebrate. Sorry for the recent quietness, folks, but with the holidays often come extreme business, and I’ve definitely been busy. However, I thought my first post of the year should be an interesting one, and it definitely is. A word of warning: extreme baby cuteness lies ahead. My wife and I started last night with the long, arduous task of taking down all the Christmas decorations. Of course, putting them up this season took longer than in the past because of our new then-four-month-old distraction, and I’ll bet taking them down will face the same temporal challenges. I took the job of babysitter (literally, as I was making it him sit up) while my wife started taking ornaments off the tree. This was largely uneventful, as Ben was distracted by the TV most of the time. Then my wife took down my Darth Vader Hallmark ornament. I seem to receive a bunch of Star Trek and Star Wars ornaments every year, and I’ll be that over the years I’ve probably ended up with almost every ornament in Hallmark’s collections from these series. Well, she set Lord Vader down next to me while she started opening his box. I was exhausted and doped up on several prescription medicines (I’m currently battling my yearly bout of bronchitis), so that was probably affecting my sense of humor. I picked up Vader and started marching him through the air toward Ben, doing the Vader breath mask sound. In my best James Earl Jones impersonation (which is admittedly pretty bad), I said, “Ben… I am your father.” And something amazing happened. Ben laughed. He laughed hysterically. Since Vader’s lightsabre was fully extended (yes, there are occasional jokes about the comparative lengths of Vader’s and Luke’s ornament’s lightsabres), I started making the lightsabre swooshing sound. Having grown up during the golden years of Star Wars, I got really good at making that sound growing up. Once I started that, though, Ben laughed even more. Each swoosh brought more giggles, which were incredibly infectious. Mind you, we’ve heard Ben laugh before, but never have we found anything that predictably made him laugh on cue. I am contractually obligated (via a marriage license and the fact that I’ll be sleeping in the back of the Ford for the next few weeks if I don’t) to post the above picture. Tonight, WVU is playing Louisville. Personally, I have very little interest in sports (I’m a geek that way) and at my best have only the tiniest comprehension of (American) football and its rules. My in-laws, however, are huge WVU football fans, as is just about every other person (living or dead) in this state. My wife is positively giddy about the game, which is undoubtedly a big deal as both teams are highly ranked this year (by some truly bizarre ranking system that I think requires a university degree in its own right to understand). 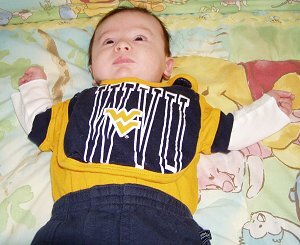 By pure coincidence, the nanny dressed Ben in his WVU onesie this morning (a gift from one of our baby showers). This sent my wife over the edge, forcing her to demand that I post the picture. And here it is. 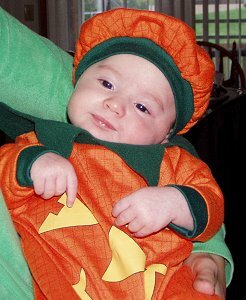 I never understood why people abuse their infant children by dressing them up in obnoxiously cute costumes for Halloween, even though they’re way too young to ever remember it. Anyhoo, in keeping with this apparent age-old tradition, here’s our son’s first contribution. Since I didn’t get to carve our traditional jack-o’-lantern this year, we’ll have to settle for a squirming, smiling, farty one. Happy Halloween, all.